Leeds secured their fourth win in six Super League matches as they scored six tries in their victory over Wakefield. The hosts led 20-4 at the break thanks to two Kallum Watkins tries and one for Anthony Mullally, with Tom Johnstone replying for the visitors. Ryan Hall increased the Rhinos' lead before David Fifita powered over to give Wakefield hope of a comeback. Adam Cuthbertson and Matt Parcell also went over for Leeds, while Johnstone ran in his second try for the visitors. The Rhinos have now won two games in a row at a canter following their 66-10 hammering at Castleford at the start of March. Watkins put Leeds ahead as he timed his jump to perfection to gather Danny McGuire's kick to run in and score. Wakefield were soon on the board as Jacob Miller's kick out wide found Johnstone, who ran in from 50 metres. 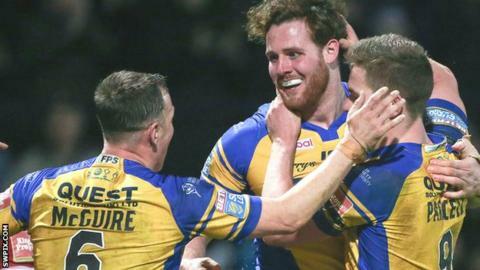 Mullally, who had a loan spell at Wakefield in 2015, powered in for the home side's second try and Parcell's neat pass set up Watkins for his second of the night as Leeds opened a 16-point half-time advantage. Ashton Golding was successful with all three conversion attempts and also added a penalty in the first half. Wakefield replacement Fifita stormed over from close range and Sam Williams added the conversion to close the gap to 16 points with half an hour to go. But Leeds responded quickly and Rob Burrow's pass sent Cuthbertson under the posts, while Parcell sneaked over from dummy half. Goulding's conversion took his tally for the night to 14 points, before the final play of the game saw Johnstone grab his second score as he went over in the corner. "Wakefield will want to be better than that. I know they're a better team than that and I'd imagine they'll be disappointed with how they played. "I don't think we saw the best of Wakefield. "My man of the match would be Matt Parcell - I thought he was outstanding. "While he's not making breaks or creating many line breaks, he holds the ruck accountable and gives Danny McGuire, Adam Cuthberton and Joel Moon a bit of breathing space." "We were out-muscled and out-enthused all night. They ran the ball a lot harder than we did and we were no match for them. We got blown away by Leeds. We couldn't live with them. "I could tell in the first 10 minutes that we were a bit dishonest in the things we were doing. Leeds were by far the best side and it could have been a bit more had they executed a bit better. "We were poor straight from the kick-off and got beaten by a far better team tonight. I can't repeat what I said at half-time. "I was very disappointed with certain individuals and the way we performed out there. Maybe a few of the guys have fallen in love with themselves after a couple of really good wins." Leeds: Golding, Briscoe, Watkins, Keinhorst, Hall, McGuire, Moon, Baldwinson, Parcell, Cuthbertson, Ablett, Ferres, Delaney. Replacements: Mullally, Burrow, Garbutt, Walters. Wakefield: Grix, Johnstone, B. Tupou, Arundel, Jones-Bishop, Miller, Williams, Allgood, Wood, Huby, Hadley, Ashurst, Arona. Replacements: Kirmond, Sio, Fifita, Walker.